Construction of Conwy Culture Centre began in 2018. The centre will include the county archives, a library, a local history point and a community heritage and arts hub. This corner of Bodlondeb park was previously occupied by a primary school. Ysgol Bodlondeb was built in 1897 on land gifted by Albert Wood, whose family had made a fortune from manufacturing ships’ anchors and cables. It was originally for girls only, becoming an infants’ school in 1927. 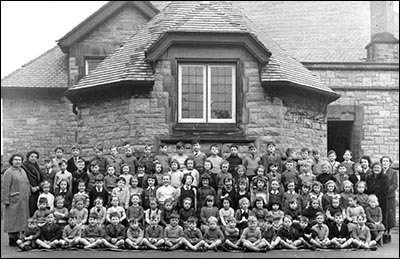 The photo, courtesy of Conwy Archive Service, shows pupils and staff in the 1950s. It closed as a school in 1998, when it was replaced by the newly built Ysgol Porth y Felin. The building was subsequently used by a youth club and other groups. It was demolished in 2018 to make way for the new centre. The new centre for heritage, culture and the arts is due to open in autumn 2019. It will feature a library, archive, café, arts space and a programme of changing exhibitions. 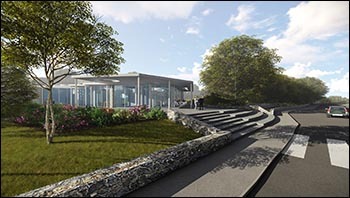 On site, there will be nearly 150,000 unique archive and museum collections that tell the story of Conwy County through objects, documents, and images. The collections will be accessible to locals and visitors and provide lots of opportunities to learn, volunteer and take part in a range of arts and heritage projects. There will be a programme of changing exhibitions and events, and visitors will be able to enjoy a coffee against the dramatic backdrop of Conwy’s medieval town walls. The new building has been sensitively designed to keep a low profile in its exceptional surroundings. Featuring a single storey, a green roof and mostly glazed walls, the building will merge with its leafy parkland environment. The Centre's collections are to be stored in an innovative basement store – the first of its kind in the UK – which will use the constant cool temperature of the earth to ensure that precious historic collections are kept in a tightly controlled environment. The basement store involved excavating an area of 1,350m3, construction of a concrete pit for the future lift and casting of a 375m2 basement slab – cast in a single pour. The Centre's £3.75m construction is being delivered by North Wales-based company Wynne Construction, which has completed many design and build projects for the public and private sectors. The new building has been sensitively designed to keep a low profile in its exceptional surroundings. Featuring a single storey, the building is steel-framed with a green sedum roof and mostly glazed walls, which will merge with its leafy parkland environment. There is more information about the project on this page.